Earn $4.24 in Rewards credit (424 points) What's This? Castelli's original Nanoflex warmers were a revolution in water-shedding technology, and now they've made them more compact and more comfortable than ever with this Nanoflex Plus version. It offers the same amount of protection from rain and road-spray, but its multi-panel design uses thinner Nano Light fabric out back for better stretch and breathability so you don't have to hold anything back when the going gets tough. Features double-sided silicone grippers at the thighs. Claimed weight is 102 g / pair. Plenty warm, doesn't sag down my leg when in use. 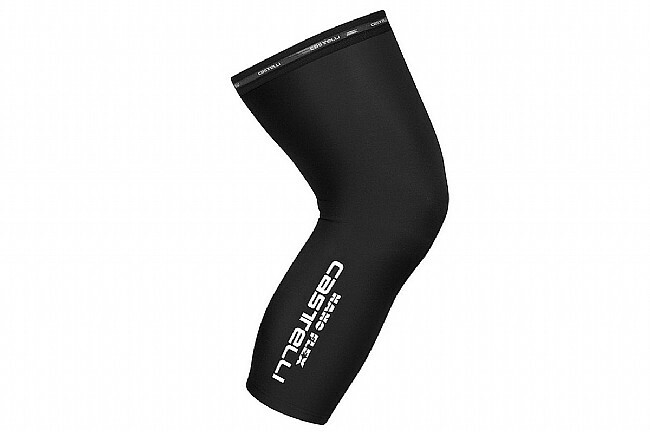 these knee-warmers keep you warm in the morning and dont slip down plus easy to take off and fold into your pocket. A little too stiff a lot too short. They do repel water nicely but the warmth you gain there is lost because they are so short you have to juuuust tuck them under the bottom of your bibs rather than having some extra length under your bibs. I stopped wearing them for this reason.